KTMtwins.com KTM Motorcycle and Product News: Vortex has your 990 Super Duke covered! 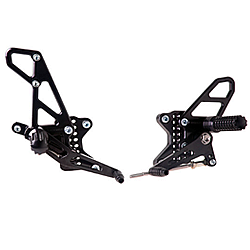 Trusted by almost every professional racer on the track and designed to be an extension of your body these are the latest greatest rearsets on the market for your 990 Super Duke! Would be nice if they mentioned that you have to re-orient the rear master cylinder and that you will need longer reservior tubing which is not supplied. Oh yeah! The bolts on the left side have to be cut down because they will extend into swing arm! OUCH!